Bicycling has become an essential part of how many people in our region get to work, get exercise, have fun, and spend time outdoors! As a region we have made great strides in improving the experience for bicyclist, but we are not done yet and we cannot settle. This year for our annual membership drive we encourage you to voice your support for continued improvement in our region by sharing your voice and becoming a WABA Member. The theme this year, I bike. I vote. 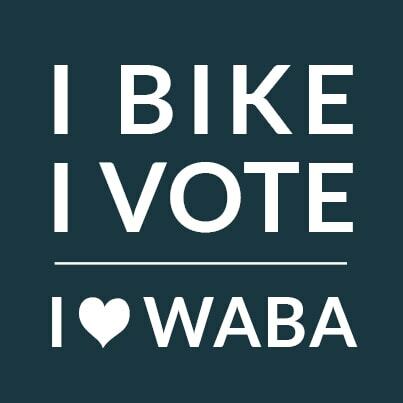 & I’m a WABA Member, aims to get our region talking about the future of our bicycling infrastructure on the eve of election season. *First 500 people guaranteed a shirt, after which a second printing may run depending on demand. Join or Renew Now to get the shirt and share your voice! If you are already a WABA Member or if you join, we encourage you to change your social media profile picture to the graphic below. Together we can show our region that we have a say too! Do you live, work, or frequent a place with a bike room or many cyclists? We encourage you to print this poster and hang it up – what would it be like if all 15,000 cyclists in our region worked together? – Annual membership is good for one-calendar year. Auto-renewing memberships are charged on the same date every year and do not expire until payment stops. – Memberships bought or renewed during the membership drive week include all regular WABA Member Benefits. – This is a limited edition shirt. That means only the first 500 people are guaranteed a shirt (there may be a second run dependent on demand). This also means there is a limited number of each size, we will do our best effort to get your first size you selected. Sizes available are XS-XL, you can find the size chart here. – Current WABA Members can receive a shirt by renewing their membership.